Fingers crossed Belvo will prevail! FrankBurke wrote: Fingers crossed Belvo will prevail! I was at it, was a good game. Rock noticeably bigger forwards but they weren't effortlessly physically superior like against Castleknock. Belvo defence was brilliant, 5 or 6 lads out on their feet with cramp at any break in play for the last 15 minutes. They competed really well at the breakdown too. If the Belvo kicker had been a bit better, they'd have won. He missed a few attempts, none very easy, but still. I would say that Rock are likely to win the replay on the basis that they looked more threatening when they had possession and made several line breaks that didn't lead to tries. They somewhat naively tried to run it from inside their own half and conceded three kickable penalties for holding on as a result (still, good to see schoolboy sides giving it a go with running rugby). Belv played more of a cup rugby game revolving around the Garryowen kick-chase. Their chase was absolutely excellent, would put many professional sides to shame. On the flip side, Rock didn't deal with it as well as they should have. The way the game was going just felt that a Rock try was inevitable as Belvo tired. They did really well to hold out but I still expect Rock to win the replay. I feel Belvo squandered their chance with the missed kicks at goal. I would say the standout players for me were Rock 13-15 Gavin Mullin, Patrick Patterson and James MacGowan, and captain no.8 Doris. Sub looshead Charlie Connolly was Healy-esque in his size and mobile ball-carrying. Belvo had less individuals who stood out but an outstanding team effort. Nonetheless I thought their outhalf Hawkshaw kicked out of hand very well and generally made the correct decisions. The 13 Conor Jennings also made some brilliant defensive reads against a Rock backline that were rampant vs Castleknock and competed aggressively at the breakdown. The winner of the replay should go on to the win the cup overall anyway, two good sides. Neiliog93 ... Many thanks for what seems an informative and 'unbiased' account of the game. Haha, are those inverted commas accusing me of bias? A fairly objective match report I feel! likely final of Roscrea vs Rock/Belvo. Conor Jennings (Belvo) is an OH by trade. He has made way in Belvo to accommodate Hawkshaw. I just watched the recording of the Rock/Belvo game....what a battle Towards the end there were more physios and medics on the field than players! What did people think of the ref? 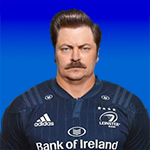 I know, but I doubt he will start for Leinster u20 next season. Anyone see the game and can shed some light on what happened here? Guessing The Ref must have had a player removed. In the Michaels match earlier in the week it seamed that the Ref insisted one of their props go off for a head injury. Michaels had a comfortable lead at that stage and only put up a very brief argument. The player in question seamed fine (from TV) and He was being seen by A Doc (looked like the Leinster Dr Ryan too, who you would presume is very familiar with such instances). In a tight match would a school be happy if a Ref was to overrule the opinion of a experienced Medical professional? Leinster Rugby has received a number of enquiries with regard to an incident during yesterday's Bank of Ireland Leinster Schools Senior Cup game between Cistercian College Roscrea and Gonzaga College. The Schools Committee in Leinster Rugby will be holding its own internal investigation following receipt of the official referees report, however in the meantime Leinster Rugby would like to clarify a number of issues to alleviate any doubt. The referee is the ultimate arbiter of all games played at all levels and it is with he/she that any final decision rests with regard to on-field activity and this includes the removal of a player for medical reasons as detailed in IRB Law 3.9. Leinster Rugby would also like to direct all of those involved with the game of rugby in Leinster to the following link which outlines clearly and concisely the protocols should a concussion be suspected at training or during a match at any level of the domestic game. In summary, Leinster Rugby would ask all those involved in the domestic game to inform themselves of their responsibilities to STOP - INFORM - REST - RETURN and if a player has any one of the signs or symptoms of concussion he/she should be removed from the field of play and not allowed to return. Leinster Rugby will be making no further comment on this matter until all of the information is to hand and the internal investigation has been completed. R-Dog wrote: Anyone see the game and can shed some light on what happened here? Guessing The Ref must have had a player removed. I heard a doctor came onto the pitch and tried to overrule the referees decision. I didnt see the incident though. 54 minutes: Roscrea lead 22-10 as Gonzaga loosehead prop Fiachra Keane goes to ground after a collision. He puts his hand to his head and remains on the ground as play moves on. At the next break in play, 20 seconds after impact, referee (Gary Glennon) and doctor (Peter Meagher) arrive to where physio Niall Bevan is treating Keane . . . Doctor Peter Meagher: Unheard comment. Referee signals for a replacement as Dr Meagher can be seen to talk loudly to referee. Referee: “Excuse me. Excuse me. Leave the pitch. Leave the pitch. Meagher: “So how could you tell he has a head injury? Physio guides Meagher away. Meagher returns to guide distressed player off the field. Play resumes with a scrum. or concussion bin in the amateur game in Ireland. may not return to the playing area. field in order to be medically examined. Reads like a RO'CK story. Well done ref. ribs wrote: Reads like a RO'CK story. Well done ref. Just watched the video of the incident and as the player goes into the ruck his head hits the ground and he can be seen holding his head briefly. No sign of him losing consciousness at point of impact. By the time the camera pans back to him as he is being treated, he is on a knee but he looks like he is going to continue until the ref intervenes. Although the medic and the physio are correct that there may not have been any signs of concussion, no referee is going to take that chance, particularly in a televised match. There was no bodily injury so clearly it was a case of a blow to the head. It is better to have strict enforcement of the rules than what happened in some of last year's Schools Cup matches where on at least 2 occasions players are clearly seen to be unconscious or very wobbly on there feet and the refs refuse to have them removed. I say fair play to the ref, brave call but the right one. Have only now seen this coverage. Well done to the Ref and let's hope his actions make the highlights reel on all coverage of the season and even Commiskey's Review of the Rugby Year. The Ref's actions should become mandatory viewing for every under-age Coach, Physio and matchday Medical Officer in the country. Pro players are beginning to change the culture around concussion by accepting the frequency of occural and the potential consequences of ignoring the immediate effects. If we can get the same outlook into the amareur game now, we have a chance of limiting one of the biggest threats to our game. As this is a personal hobby-horse, I will also add that every under-age player and Coach should also concentrate on the other most important aspect of the battle against concussion. EVERY PLAYER MUST PRACTICE THEIR TACKLING WITH BOTH SHOULDERS. In my experience as player, referee, coach over a long period in the game, this is undoubtedly the biggest contributor to concussion. Possibly as many as 80% of players can, or will, only tackle on their dominant side, usually right shoulder for right-handed players. In NZ, alongside playing underage rugby by weight, not age, every kid is rigorously schooled in tackling both shoulders and huge attention is given to his, or her, "weak" shoulder. This is absolutly vital for our game and our young players safety. Every underage Coach should make available 15 mins in the next week, and every future week, to work on this skill. You could be saving some kid from early dementia. Now wouldn't that be worth a full Coaching badge? Another classic in progress in Donnybrook! Dave Cahill wrote: Another classic in progress in Donnybrook!